I'm sitting here ready to watch the Broncos V Sharks. And it is clear that regardless of the result, the Raiders' finals hopes are pretty much gone. 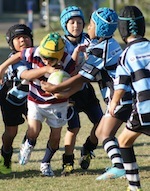 I invest much of my life in the Raiders and Canberra rugby league. But the Raiders are failing the rugby league community in Canberra, consistently. I'm tired, I'm worn down by a lack of success delivered by the Raiders for nearly 25 years. It is no finals for this year again, four out of the past five years. The club has had decades of failure. I feel like there's not much hope. I do hope the Raiders can perform the miracle, win every game... make the finals... win the Grand Final. I desperately hope for that. But I somehow feel that hope is forlorn. The club shouldn't be in this position, with the talent on the books. The salary cap position seems dire. The Raiders are losing high profile players and don't seem to be signing any player of any serious note. And we're just told... we don't have room to do any more than upgrade. I just shake my head at that. I don't know what the solution is, but every way I look, I don't see much hope. Something has to change. I'm not sure what, but the club is in a mess and needs rejuvenation. It certainly is disheartening. The part that gets me the most is that, to me and I know a lot of others, it seems like it is obvious what needs to change but I just cannot see any sign of it on the horizon. The club needs a change of leadership, from the very top down. It is the same problems which affect us week in, week out for over a season now and the coach cannot fix it. But the club shows no sign of wanting to move him on, and even if they do I am far from convinced they have the ability or desire to appoint someone who can do a better job. Just to be clear, I'm certainly not saying it is the coach. 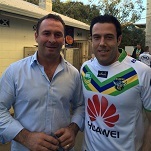 I love Ricky Stuart. It might be as simple as bringing in a defensive coaching assistant... because that's the major weakness on the stat sheet. But I just don't know what it is. The club is failing to deliver success... and it is now up to the board... maybe the "owners" to work out just what it is. Because there are now decades of failure on the record. And something needs to re-boot. PJ... I just don't see what the club is doing right now to turn this around... and generate some success. I'm disappointed in what the club is delivering at the moment. And the fans deserve some reason for hope. And the club needs to tell us what the plan is to achieve success. I'm all for accountability. The NRL has to be accountable for what it is doing... and I'm disappointed with what they're doing, especially after this week. But the Raiders have to be accountable for what they're doing... and I'm not seeing any vision for the future from the club. Yep..other clubs get in a funk and act. There's got to be someone within our organisation that says "right lets fix this, let's win some premierships"
Seriously GE, we'd be better off cheating. It brings success. I've been feeling like that for four or five years now. The short answer is we need to wheel Bonehead into the retirement village, scrub the board, punt the CEO, thank Ricky for his passion and bringing a spark of hope to the club in 2016, and start again. Until that happens we are just circling the drain. The fan is a peripheral concern to this organisation, which is more interested in buying another pokie-laden club than success on the pitch. Until there is a change at the top and everyone involved in the club stops accepting medicracy and/or offering an excuse for it nothing will change. I understand how you feel GE. During the early rounds of every season I have great optimism and hope that this year will be the raiders time to shine. Then the disappointment. The 1st 3 rounds of the year broke me. I was devastated. After 3 rounds I knew we were cooked. 3ROUNDS. I've watched the games and supported the team but I was already preparing for 2019. My little green heart is hurting. Chins up raiders faithful 1 day we will rise again. Donny would love to explain it to you. But there's no explaining it. So we just go onwards, BAU. What does BAU mean Roger? Oh... don't bother, I've twigged. Nope, there's no enjoyment in what's going on. We have a few runs at the finals, only to fail in the finals. Then more years in the doldrums, failing to make the finals. I'd love to see the club make the finals this year. It is still possible. But if they don't make the finals, it is one finals appearance in the past six years for the club. That's simply not acceptable for a professional football club. There needs to be a review into why the club is failing in so many ways. Look, there are ways where the club is succeeding. Membership, for example. Community engagement. But a lot of that is off the back of 2016. It is success ON the field that counts most. We are failing big time on the field. The club needs to work out what now needs to be done to deliver on field. And quickly. And not just to be vaguely competitive, making eighth one year, making ninth the next. They need to work out what they need to do to become a powerhouse of the competition again. At least put the club in a position to win a premiership once every decade or so. At the moment, I fear there is no prospect of the club winning a premiership in my lifetime. and don't seem to be signing any player of any serious note. I've said it for years now, and every year I am more certain of it - the Raiders will never win another premiership. We're just fundamentally not built for it. Rugby League as a sport has just been in deep decline for 10 years IMO. The on field product really struggles to hold my attention, I haven't bothered to watch a single neutral game this year. I think the code is broken at the top level. It's just an absolute Mickey Mouse operation at NRL HQ, and it's hard to see how this could ever flow on to any success for the lesser clubs beyond a season or 2 here and there. - Referee tip sheets. No refereeing decision should be impacted by what has happened in a past match. - Penalty counts being evened up. I knew we were in trouble in that Warriors game as soon as we got 3 penalties in their 20m zone to start the match. The referee should not be getting a running update from the man in the bunker, it's okay for penalty counts to be lopsided if it's deserved. - Video ref referrals are out of control. Instead of admiring the skill shown to score a try we're immediately doing a review on every potential negative play in the build up to a try. The fact they refer what must be 3 out of every 4 tries these days takes me out of the game. - Referees being demoted to matches with lesser teams. I mean seriously, the level of incompetence with this announcement was just off the charts. The NRL doesn't treat each team in the competition with equal respect, we're the idiots paying for membership and merchandise while we're regarded as a second class outfit. I don't really count Ryan Sutton as an English international... John Bateman... I'm still waiting, waiting, waiting on an announcement. Now I need a drink..
A serious question for me is why can't the NRL attract a top tier Adminstration? We're always a laughing stock in terms of professionalism. You tell me how many you recognise. Don't look them up on the net. How many do you recognise? How many of those have any idea about rugby league? However... this thread is about the Raiders... and why the Raiders consistently are failing. And I think we need to start accepting this... the Raiders' failures cannot be blamed on the NRL. The Raiders need to take accountability for their own performances. This is the first step to rebuilding the club. I wonder if the NRL doesn't hate actually hate the Raiders per se, but the current administration, due to it's policies pre-Ricky to do the bare minimum on the field and serve up teams comprising has-beens, mediocre locals, and chancers for a decade and a half. You've now led me to needing a drink and I almost never touch the stuff. We were one game off the Grand Final 2 years ago. With an ounce of luck this club is capable of winning the comp. We are at a competitive disadvantage compared to half the clubs in the comp, but if the Cows and Tigers can be competitive we sure as hell can be too. Coaching has let us down recently, but so has some terrible attitudes from a number of key players. I've attended one game this season for a variety of reasons. It just hasn't been a priority for me to go. I love this club though and I always expect success to be around the corner. With some half decent coaching and a touch of luck with injuries, this team should have comfortably been in the top 4. I have no doubt of that. The only hope I hold onto is that I’ve seen Cronulla wait 50 years for a premiership, Souths 43 years so I hope in the next 20 years we can jag one somewhere. It will probably have to be a fluky one like the Tigers in 2005. I still believe 2016 was the one that got away but seems like a distant memory at the moment. But in the current climate of the NRL we are just not relevant enough for us to win a Premiership, it’s just an unlevel playing field. It's tough. I felt lower when Milford left and Tedesco backflipped but then that lead to us signing some good players for once which is what ultimately got us 2016. Now we can't recruit again and its hard to see us not getting worse next year. Still, I'll back up and watch them this week and every other week they play. I can't help myself, its just part of me now. Last edited by edwahu on July 26, 2018, 10:05 pm, edited 1 time in total. Of course we watch, hope for a win. But this is a situation where the club needs to give hope for the future direction. We’re not getting it. One area of RL and particularly the Raiders I haven't followed much in recent years is the juniors/pathways stuff. We used to have a great junior base with stacks of great young players coming through, is this still the case or have we dropped the ball there or just a lean patch? I honestly wouldn't know a great deal about it right now. It's always going to be tough for us to keep players but this is an area which IMO is absolutely crucial to our chances of future success.